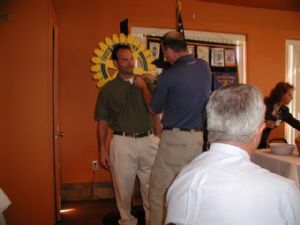 David Carvell from RSC Rentals is pinned as the newest member of Fort Yuma Rotary. Dave, who was sponsored by Keith Boyd, comes to us by way of Mississippi, and is very happy to be settling into the desert with his family. Dave feels very much at home in Yuma and is very impressed with the quality of people he has met since moving here, not the least of which since he has come to know Fort Yuma Rotary. We welcome you Dave, and we hope you enjoy our club.